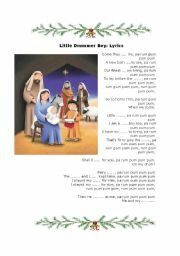 Third and last part of this Useful reading comprehension worksheet about the history of Christmas, based in actual facts... it is included a set of questions about the text. Hope it´s useful for you. 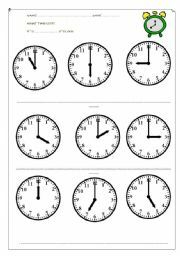 Good and basic worksheet to practice learning to tell time, by hour and by half. This is a St. Patrick´s Day comic strip reading comprehension. 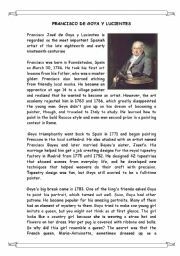 The main objective is to understand and identify the main events in the story... after reading, students will have to answer few questions about the story. It works fine for my 6th graders although they´d need a little bit of help with the vocabulary. Hope it´s useful. 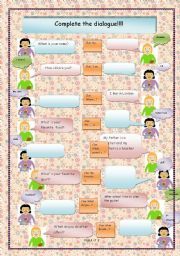 Basic and funny worksheet to practice greetings and everyday vocabulary.It looks a little off but pictures and speech bubles match perfectly once downloaded. Hope it´s useful. 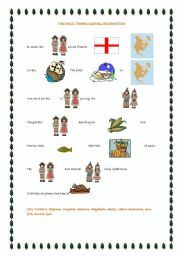 Very easy reading comprehension story about the first Thanksgiving. 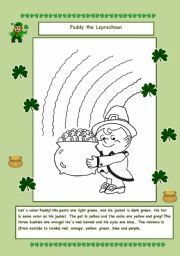 Funny and easy coloring activity to celebrate St. Patric´s Day with our youngest! 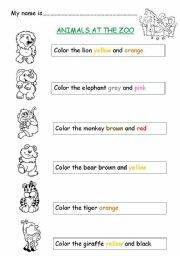 They have to read (or the teacher will read aloud) the instructions and color Paddy as it is required. Hope it´s useful! 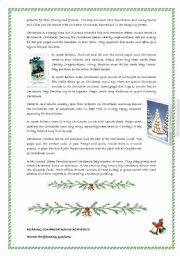 Fun christmas fill in activity! Enjoy one of the nicest Christmas carols ever!